Our second Estate Chardonnay release is a study in subtlety, balance, and poise. It’s not a blockbuster wine but rather one that charms with its gradual rising concentration, long elegant flavors, and great detail. There’s a great deal of complexity on offer here but at this early stage, it’s bound up in the wine’s youthful structure. As the wine ages, however, its broad richness will steadily assert itself. 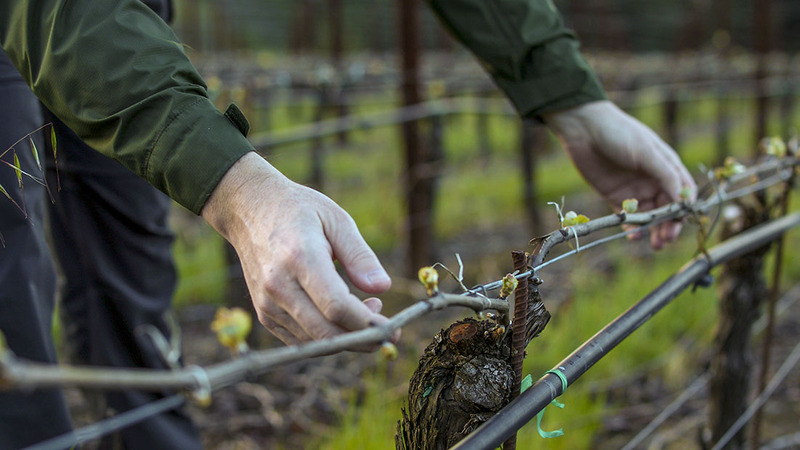 As a product of our most densely planted vineyard, there’s less honeyed Californian fruit on display because the clusters themselves receive less direct sunlight due to the tight vine row spacing. Instead a myriad of complex savory elements really drive the wine and make it unique within our Chardonnay line up. On opening the wine is very clean and intensely ‘snappy’ in the glass, but with breathing time its natural concentration and weight, derived from low vine yields, really take over so that by the end of the evening, the wine’s subtle power is the lingering theme. There aren’t many Californian chardonnays that can match this wine’s subtle polished elegance. Very pale straw color. Opens slowly with flint, lemongrass and fresh green herb aromas. Richer melon, toasted almond and baking spice notes take hold with mint and chamomile aromatic complexity. Clean saline palate entry, grapefruit and quinine notes then white peach, quince paste, apple and ginger. Building texture but always clean, pure and focused with lingering subtle acidity. Serve closer to 60 degrees and drink between 2014 and 2020.